North52 Business Process Activities (BPA) exists as a managed solution within Dynamics CRM. This managed solution contains both the business rules engine & the HTML5 editors to create the business rules. The architecture of North52 BPA is built using plugin's which are a standard extensibility point of Microsoft Dynamics CRM . 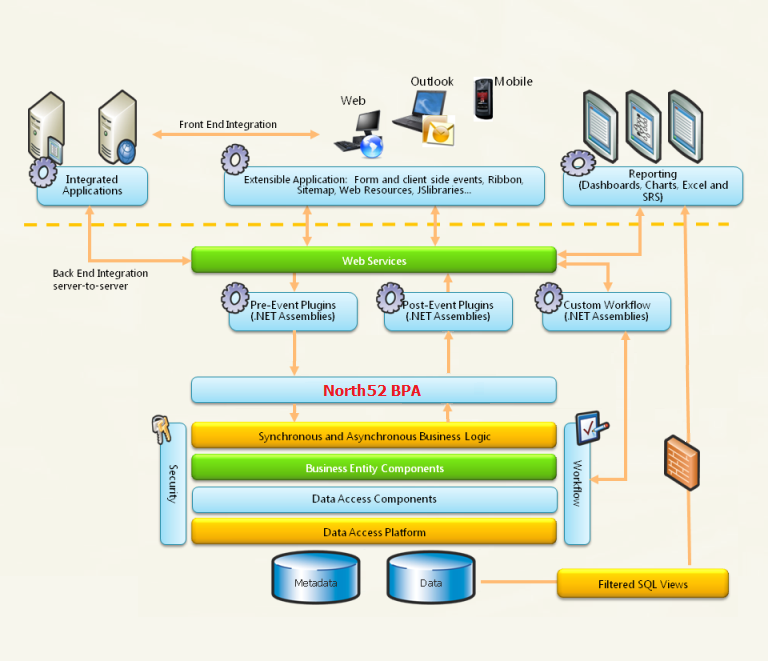 The diagram below shows how North52's BPA integrates with the Dynamics CRM platform. North52 BPA loads all the active formulae you have defined in your Dynamics CRM system into memory & then effectively listens for a user action and will execute a formula when required. You can effectively daisy chain formulae together by setting the Execution Order field on formulae that are all related to one entity, pipeline stage & pipeline event combination.